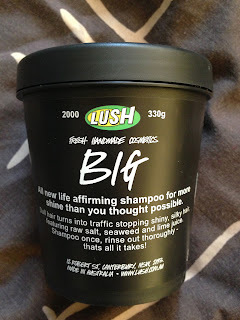 The Shopping Queen: Lush Haul! I'm super excited about this haul as I love Lush products :) I had a lipstick review planned for today BUT... I just really wanted to share this haul with you first. I'm most excited about the I Love Juicy shampoo that I picked up. It has mango, pineapple, kiwi fruit and papaya in it but it kind of reminds me of orange juice.. I love orange juice so much that I'd wash my hair with it if I could :P This was $20.50 for a 250mL bottle. I think the 100mL bottles look kind of pathetic and the 500mL ones are too big! (but way better value for money). I wish they came in a 300 or 350mL bottle. "All new life affirming shampoo for more shine than you thought possible"
Loosely paraphrasing the Lush description: 50% of Big is seas salt which is used for shine, softness and big endowments (huh? Can someone please explain what big endowments means?). It gives limp hair more volume, the seaweed infusion softens hair and the fresh lime juice makes your hair shiny. I picked it up on my second visit and it was $25.95 for a 330g tub. 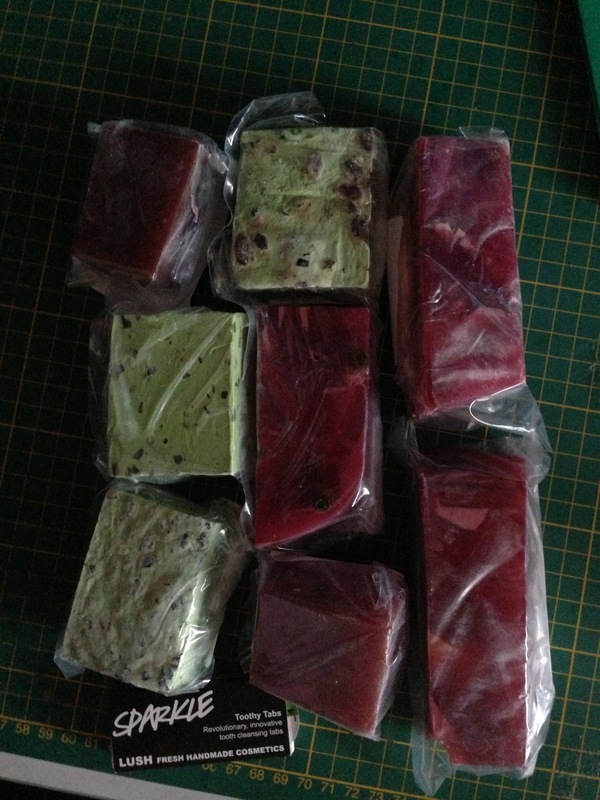 I also bought 9 blocks of soap... In my defence, 2 of the 3 types were on sale as they were Christmas editions. The two long ones on the right and the one right in the middle are Mr Punch. 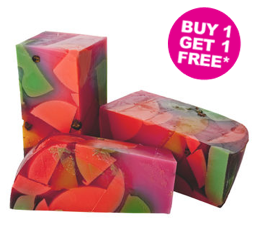 I believe that this is a fruit punch inspired soap. It was originally $59/kg but I got it for half price. The promotional pictures on their US website look way better than the real thing! The soap in the top left hand corner and at the bottom of the middle row are The Godmother. Lush describes the scent as being similar to the "best selling Snow Fairy shower gel". This is $6.50/100g. I also got Sparkle which is from the Toothy Tab range. They're basically chewable solid toothpaste tabs. These were $2.20/box. And lastly, I picked up the Buffy body butter. This is an exfoliating scrub with rice, almonds and beans in it. After using this in the shower, you don't need to moisturise afterwards :) This would be amazing in winter when it's freezing cold and I can't be bothered to moisturise as all I want to do is run and jump in bed :P I thought that it was really expensive at $15.95/block. Each block weighs 90g. What other Lush stuff should I try? I want to get a good conditioner for dry hair. Great haul. Big and Buffy are two of my faves, and that shampoo sounds good enough to eat! Lush soaps always look so much prettier in the promo pics. Love your lush haul! I've tried the H'suan Wen Hwa conditioner and did a review on it (I think you've already read it). It's good but to me, it stinks. I hate the smell of cloves, and thats exactly what it smells like. I love Lush and like you I always find myself purchasing things I otherwise would never have considered. I think it is the ladies that work there, they are always so welcoming and make me want to buy everything! I love their lip scrubs and their Snow Fairy shower gel, though it is unbelievably sweet - it certainly wouldn't suit everyone! It's definitely the ladies who work there :P They always make me try everything and give really good recommendations. I haven't used my bottle of snow fairy yet. I bought it when it came out but it's just been sitting around. Sounds lovely :) I love lush, I like the lip scrubs and the moisturisers the most, I haven't tried their hair products! I'll do a review of it soon :) I'm going to use it tonight. I've been hearing a lot about Lush lately and it looks pretty interesting! Great haul I love lush products!. Woohoo you got Big! A lot of people use it as a clarifying shampoo, so just every now and then to give a full on clean, so maybe if you don't like it for every wash, try that! I'm the same with Lush, there is NO way I would spend that much anywhere else, but... I think to myself "It's natural..." haha! I really want that I Love Juicy now! It sounds like it smells amazing! I'm going to start using Big soon! My hair is getting pretty grotty with the sweat and the heat.